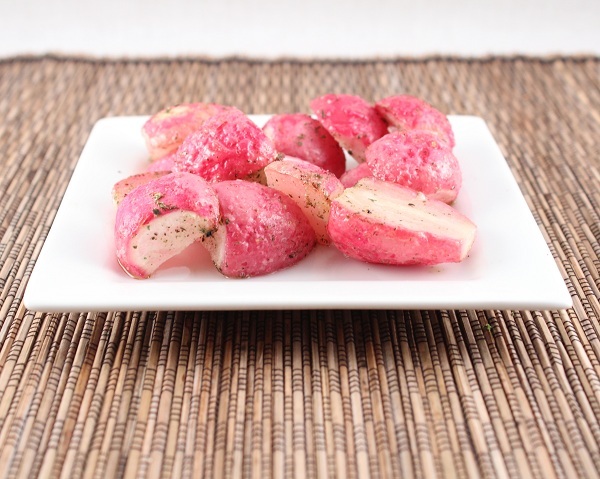 Preheat oven to 400 F. Place the prepared radishes on a baking sheet lined with parchment paper. Drizzle the radishes with 1-2 Tbsp of olive oil and sprinkle the seasoning over the radishes. Toss to combine and make sure all of the radishes are covered with seasoning. Bake for 20-25 minutes or until the radishes are cooked though. Combine the parsley, dill, and basil in a spice grinder or mortar and pestle and grind to a powder. Combine the mixture with the rest of the ingredients. Makes about 4-5 Tbsp. To make Low Carb Ranch Dressing mix 2 Tbsp of Ranch seasoning with 1/3 cup mayonnaise and 1/4 cup of coconut milk or heavy cream.